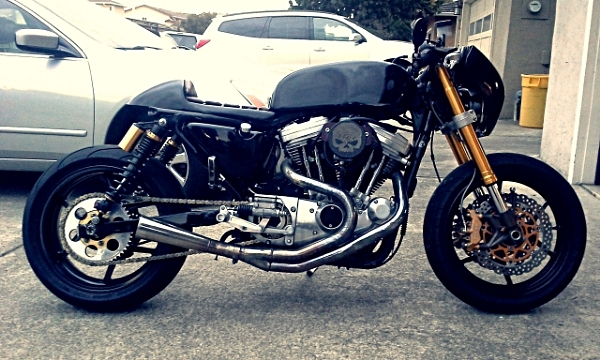 A Harley Davidson motorcycle that is anything but, and a cafe racer that's probably too brute to be a racer. It's not what it used to be, and it isn't really anything like what its silhouette illustrates. With a 1450cc big bore kit on the already big V-twin HD powerplant, the bike would probably loft the front wheel up every time you twisted the throttle. You can't steer a bike with the front wheel up in the air, so this really isn't an effective racer, is it? 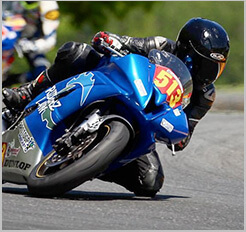 And with much of the heavy bits from the original parts of the bike having been shed – the tank replaced with an aluminum alloy unit, and a Kawasaki ZX6R front end with cast aluminum front and rear wheels – there's even less sprung and unsprung weight to dilute the big-bored engine's torque output to the rear wheel, the original belt-driven final drive having been converted to a chain drive for even more minimal loss of brake horsepower. This bike could be trouble, but I feel like causing trouble. Whatever it is or isn't now, it's simply badass. I had been eyeing this bike in my local Craigslist for awhile now, remaining listed for weeks on end whenever I searched for "cafe racers" to buy or build. If it wasn't for the seller's asking price, I probably would've checked out the bike in person much sooner than last night. However, despite the price, the bike always caught my eye. It appeals to my appreciation for cafe racers and being a Harley Davidson platform, it further piqued my curiosity. After all, before becoming the sport rider that I am and have been, it was a Harley Davidson Sportster 883 I first swung my leg over when I was looking to buy my first bike. And I've only remained curious about Harley Davidson ownership since, with the only thing stopping me from giving it a try is that my master-mechanic friend Rob refuses to work on Harley Davidsons, which would mean that I'd be on my own wrenching the non-metric motorcycle, or take it to someone else I don't trust as much as I do Rob. But I had looked at the bike's photos and read the words in the seller's ad enough times that I felt it time to put myself out of my misery. I had to see the bike in person to really have an idea of what I may be up against, what with my interest in it only growing every time I ran into its ad again and again. So I made contact and arranged to view it directly after work, on my way home. It is a clean and sleek build in the flesh, and even more imposing in life than it seemed in photos. It's smaller than what it started out as, yet its presence isn't short on intimidation. To my eyes, it was a beautifully brutal motorcycle. I picked the seller's brain on it, finding out as much on the history of the bike and its build as I can. Then I asked him why he was selling it. He had been using it to ride with his wife on the back (the bike came with an interchangeable bench seat), but it wasn't comfortable for that, so he's looking to replace it with a more appropriate, passenger-friendly motorcycle. He didn't commute on the bike, having bought a CBR250R for that duty. So all the bike had been to him was a weekend rolling showpiece. I told him that if I were to purchase the bike, my intent is to replace my Honda Hawk GT with it, doing commute duties to work four times a week, over 25 miles each way. The seller frankly did not recommend it. He noted that it isn't the most comfortable bike to be a daily driver, and while 25 miles isn't that long of a ride, he believes that the high vibration output from the engine to the rider on top doesn't make for a pleasant daily experience. I told him I appreciated his honesty and opinion on that, as that has become the bigger point of consideration for me than the price (which the seller is negotiable with). Generally speaking, any bike from this point that I would consider buying is to replace my Hawk GT, and I'm simply not interested in a weekend toy or a rolling garage queen, which sounds like what this HD Cafe Racer is more suited for. We agreed to keep in touch while the bike remains in his ownership, and I consider whether I want to risk eschewing his warnings, and give this bike a try for daily duty. So here I am deciding how masochistic do I allow myself to be on such a beautifully sadistic motorcycle.